Whether you are moving or storing, Storage Solutions is ready to assist you. 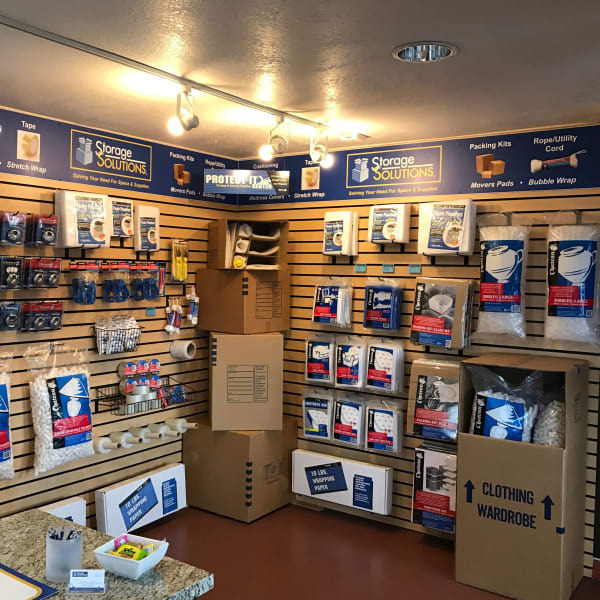 From small boxes, bubble wrap, wardrobe boxes, and newsprint to moving kits and dish packs, we have a solution for you. Let our moving and storage professionals help you decide what will work best while keeping you within your budget. Visit us today and take advantage of our great prices! Small Carton: These are small, easy to handle and designed for heavier items such as books, tapes, cd's and canned goods. They also work well for small fragile items like dishes and ceramics (when used in conjunction with foam pockets or padding of some kind for protection). Medium Carton: A good general purpose packing box. Can be used for clothing, large pots, and larger kitchen appliances. Large Carton: This box can be used for pillows, linens, table lamps, artificial plants and any bulky items that do not weigh too much. Use caution, this is one box that often gets over packed. Extra Large Carton: This size box is used for pillows, cushions, board games, stuffed toys and comforters. Use caution not to over pack with too much weight. Hanging Wardrobe Boxes: This box has a metal bar across the top and used for hanging clothes. Primarily used for protecting hanging clothes, minimizing wrinkles and helps to keep clothes clean. It can also be used for any large bulky items such as large lamps, artificial plants, and seasonal clothes, and in some cases a chandelier. Record Storage/File Boxes: This box has double sides and bottom for strength and does not require tape. These boxes are primarily used for storing hanging files or records but also work well for holiday decorations. Businesses as well as individuals use these in larger quantities generally at the end of the year and around tax time. The boxes come in two pieces as a top and bottom. They are very sturdy and have hand holes for easy lifting. Call now or stop by to see what we can do for you. Be sure to ask about our bulk pricing!